For the past several years, we have partnered with Aqua-Tots Swimming Schools to construct some pretty amazing indoor swimming pools within the Dallas Fort Worth Metroplex. These pools are commercial indoor pools and have to be constructed within a pre-existing building. Complex and delicate doesn’t even begin to describe the difficulty of these jobs but Aqua-Tots is pleased with our results and so are we! Summerhill Pools constructing a new Aqua Tots Swimming School. Plaster is being applied to the freshly constructed gunite shell. Founded in 1991 by Ron & Jane Sciarro in Scottsdale, Arizona, Aqua-Tots Swimming Schools has one mission: to teach children and parents how to safely swim. Their indoor facilities allow for year-round lessons with comfortable water temperature of 88-90 degrees Fahrenheit. Safety is always their number one priority. They rigorously recruit, train and test their staff to ensure that all properly certified in CPR & AT-WSI (Aqua Tots Water Safety Instructors). Since their inception, Aqua-Tots has experienced incredible growth. They utilize a simple business model focused on teaching children and their parents to swim safely. Drowning prevention is a huge focus for them and they emphasize same swimming practices and ways to identify drowning in order to save lives. They operate as a Franchise with many locations throughout the country and 11 currently located in Dallas & Fort Worth. We have built several swimming pools for Aqua Tots to-date and it is a growing relationship that we are very proud of and blessed to have. How Do You Build a Pool Indoors? After identifying the specifications for the job, we needed to layout and execute our strategy for making it happen. Like all commercial projects, there are always challenges. 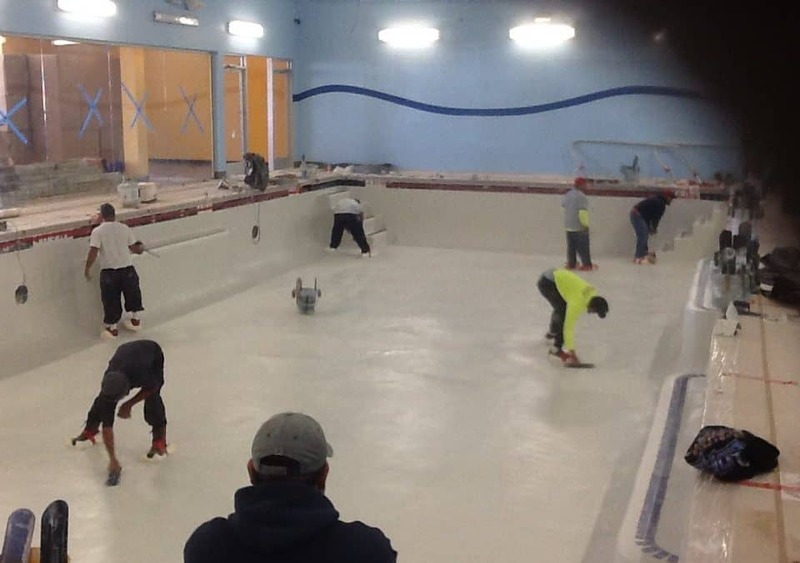 Each commercial pool that we build is unique in its own way and must be handled differently. The challenge for these projects is spacial by nature. Constructing an indoor swimming pool inside of an existing structure with relatively little space while operating heavy machinery is tricky, to say the least. Without diving into too much of the details, we successfully removed the doors and surrounding glass panels to the storefront to allow for our Mini-Caterpillar Excavators to enter the job site. Once inside, space was tight but we resumed normal operations of excavating and removing the earth to create our pool shell. Working with wonderful clients like Aqua-Tots requires extensive attention to detail and a plethora of communication throughout our entire construction network from start to finish. We take all of the pools that we build very seriously and always proud of our results. We will be posting many more jobs and videos such as this one for you to see later on. If you have any questions or would like some more information on what Summerhill Pools can do for you, we invite you to contact us today for a free consultation on the next steps for your own personal pool or commercial property.